Second, anthologies give inordinate attention to footnotes, riddling the poetry with superscripts and piling lines of explanatory text at the bottom of every page. 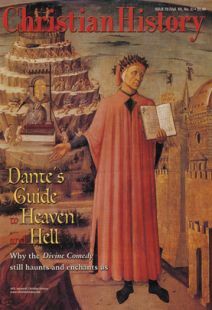 Readers need some information on the many people, places, and events Dante mentions, because otherwise the poet’s points would be entirely lost. But overemphasis on names and dates causes the Comedy to read more like an old newspaper than like an artistic masterpiece. Returning to the Route 66 analogy, footnote freaks are the well-meaning parents who stop at every historical marker along the road. Educational, yes, but also extremely jarring. Perhaps the biggest mistake made by many teachers and anthologists, though, is believing that a small dose of Divine Comedy will produce lasting benefits for their pedagogical patients. More often, the dose inoculates students against ever wanting to see the poem again. We assume most of you dutifully received your Dante vaccinations, but we hope that the ill effects have worn off and you are ready to give the poet another try. He has so much to offer—adventure, romance, humor, reflection, and the most engaging expression of the medieval Christian worldview available.